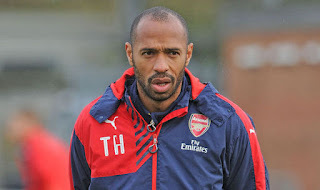 Thierry Henry has once again shown the world that he can still deliver if called upon to represent on the field of play. The former Arsenal striker who is currently assistant manager with the Belgian national team performed some skills with the ball in training. Standing over the ball, the Frenchman pinged it with the inside of his foot before kicking it back hard against the ground. This caused it to go high into the air and Henry sealed it all up with a slick header. Take a look at the video posted on twitter. Henry made a return to the Belgium national side prior to their encounters with Scotland and Iceland in an international friendly and UEFA Nations Cup respectively. The 41-year-old was linked with moves to Bordeaux and Aston Villa but we gathered that talks with the former over a managerial role did not go well and as such he retains with the Belgian national side.